He mar 31 July 1798, Alford [she was already pregnant] to Sarah Wilson [born or bapt 10 Nov 1776]. She was dau of Alexander Wilson, of Wellheads, S side of Alford town (see map) by his wife Agnes Wilson. Alexander Wilson and his wife seem to have been originally from Archballoch, SW of Alford (see map). Jim Everett said Sarah was born 10 Nov 1776, Wellheads. [Kirstine Holmes] says she was bapt 10 Nov 1776, Alford. In [1851 census] Sarah is living as widow in Mid Mill, just W of Gallowhill, W of Alford (see map). She is described as a "worsted knitter". Sarah was one of the models for the John Phillip painting of 1855. She died 9 Jan 1856, Mid Mill, age 79 yrs. bapt 22 Nov 1798, "Kinstairs", Alford (must be Kinstair, S of Alford, see map). living Mid Mill in [1851 census]. died 3 July 1845, Alford, age 40 yrs. [Kirstine Holmes] says born 15 Nov 1826, and bapt 5 Dec 1826, Alford. William Murray, bapt 19 Feb 1828, Alford. living Alford village in 1851 census. living Alford village in 1851 census, listed as "farmer's son". Sarah Murray, bapt 6 Aug 1832, Alford. Peter Murray, bapt 6 July 1834, Alford. living Alford village in 1851 census, age 13.
living Alford village in 1851 census, age 11.
mar 27 Sept 1846, Alford, to George Eddie. living with parents in 1881 census, listed as "carter". living with parents in 1881 census, listed as "domestic servant". John Murray, bapt 11 June 1856, Alford. Alexander Murray, bapt 6 Feb 1860, Alford. mar 21 Nov 1841, Alford, to Harry Lumsden. Sarah Wilson (born 1776) was the model for the old woman in the centre of this painting. Her daughter-in-law Agnes Jeffrey (born 1798) was the model for the woman on the LHS of this painting. 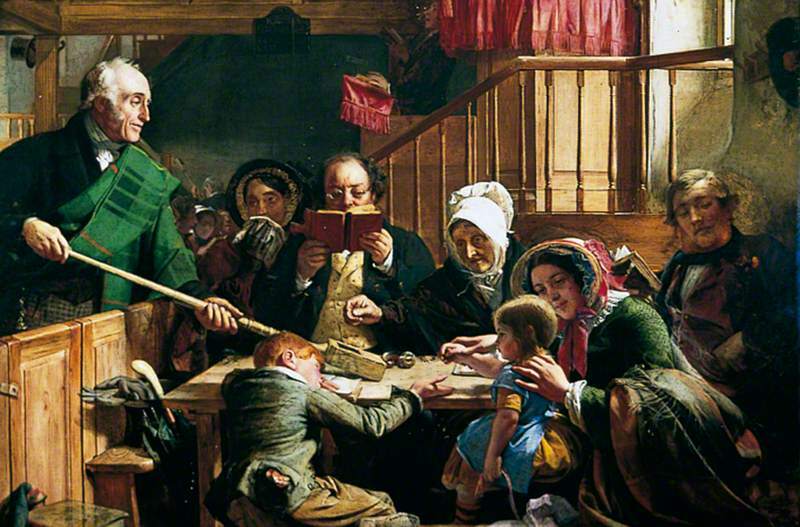 "Collecting the Offering in a Scottish Kirk" (and various other names) by John Phillip (1855). Also called the "Spanish" Phillip painting. He used locals in Alford as models. Hangs in York Art Gallery. From BBC. Also on Wikimedia Commons.